Kids like moving their bodies! Here are three fun activities that build flexibility, balance, strength, and coordination. Safety Tip: Remember, do not force yourself (or children) to flex farther than is comfortable, with a slight pulling feeling in the muscles. Hold the stretch, then gently stretch a bit further. Never force a stretch. Crab walk: Have children sit with their knees bent, feet flat on the floor in front of them, feet apart. Next show them how to place their hands down by their sides, but slightly behind their backs. Then, they can raise their hips off the floor. Now they can walk forward, backward, and sideways, pretending to be crabs. Arches: Have the children lie on their backs. Help them place their hands on either side of their head beside their ears. Their fingers point back toward their shoulders. Help them place their feet flat on the floor near their bottoms, knees bent. 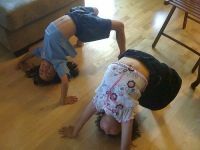 Next, have them raise their belly button straight up toward the ceiling, trying to make an arch. Some will have a lot of arch to their backs. Some will look more like tables. How to keep them safe: You can help them either by standing over them, using both of your hands on their waists, or by sitting or kneeling beside them with one of your hands under the arch of their backs. Be very careful of your own back. Gently place your hands under their backs and pull up just slightly, to give them the idea of arching. Backbends: After they have conquered the arch or bridge from a lying position, if they are feeling daring, have them start from a standing position. You will need to “spot” them for safety until they are proficient. The safest way I have found is to kneel by their side on one knee, with the other knee bent under their backs. As they put their arms over their heads and begin to slowly bend backwards, keep your hand under their backs to steady them, so they don’t fall on their heads. Your thigh will also help cushion them if they lose balance.